According to Norse mythology, Valhalla is an enormous hall located in Asgard where those who die in combat travel to battle and feast with gods. Thanks to Wazdan, you will have the chance to visit this mythological place, so prepare yourself for a unique gameplay experience! Valhalla offers 4 reels with 54 paylines. The video slot’s background consists of Asgard and there are some amazing building floating in the air which captures the mystical atmosphere of the game. There is a wonderful ambient background music playing in the background that contributes to the theme of the game and the symbols included in the video slot are perfectly crafted. Once you give Wazdan’s Valhalla a spin, you may expect to land a variety of theme-related symbols, including runes, Loki, Freyja, Thor, Heimdal, Odin and Valkyrie. 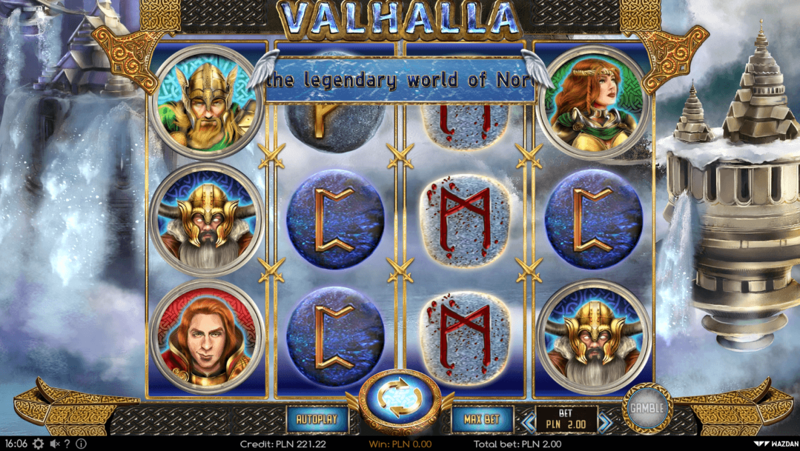 Apart from detailed graphics, Valhalla offers some rewarding special features that should make winning some extra cash as easy as pie, so be sure to check out what this video slot is all about! Valhalla pays both ways, so if your winning payline starts from the fourth reel, you will receive a nice cash prize. Not many games include this feature, so playing the video slot delivers a quite new feel. The Valkyrie symbol represents the online slot’s Wild Symbol and it substitutes for all symbols. The Wild Symbol lands quite often and it should help you to complete multiple winning combos. If you like to take risk, you can activate an amazing Gamble Feature after triggering each win. Once you do so, you a Norse god appears and you have to choose one of two doors, one of which lead to Valhalla. If you pick the correct door, you double your cash prize. Give yourself a chance to win loads of cash and play Valhalla at your favourite Wazdan-powered casino. The online slot delivers loads of fun, so you won’t regret it!